We've saved the best till last, a Christmas Eve classic that's going to really warm the cockles of your heart. 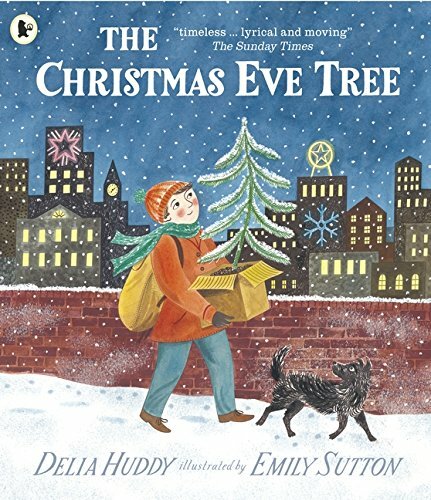 Our final Booky Advent Calendar book this year is the fabulous "The Christmas Eve Tree" by Delia Huddy and Emily Sutton. It's the night before christmas, and just as the shops are about to close a young homeless boy spies a rather forlorn looking tree in a store. No one wants to buy it, everyone prefers its taller brothers and sisters but the boy begs and pleads with the shop owner, who gives the tree as a final Christmas gift to the poor lad. Down by the river, as the cold night draws in, the tree is dressed and decorated by the boy. But there's more christmas magic afoot, as they both find themselves at the centre of an amazing christmas miracle. Be prepared to dive for a box of tissues with this one, it tugs on your heart strings and if you're snuggled up tonight with a cup of cocoa, spare a thought for those who may have to spend the night out on the streets with this story of hope and kindness. "The Christmas Eve Tree" by Delia Huddy and Emily Sutton is out now, published by Walker Books (kindly supplied for review). Well as it's Christmas Eve we couldn't resist queueing up an extra book recommendation for our Booky Advent Calendar, after all don't the christmas eve advent calendars always feature the biggest chocolate? 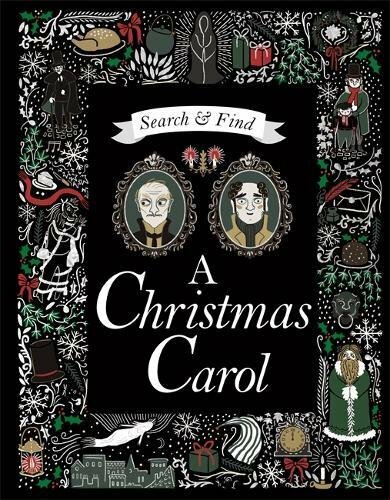 Here's "Search and Find: A Christmas Carol" by Charles Dickens, with fantastic artwork from Louise Pigott. 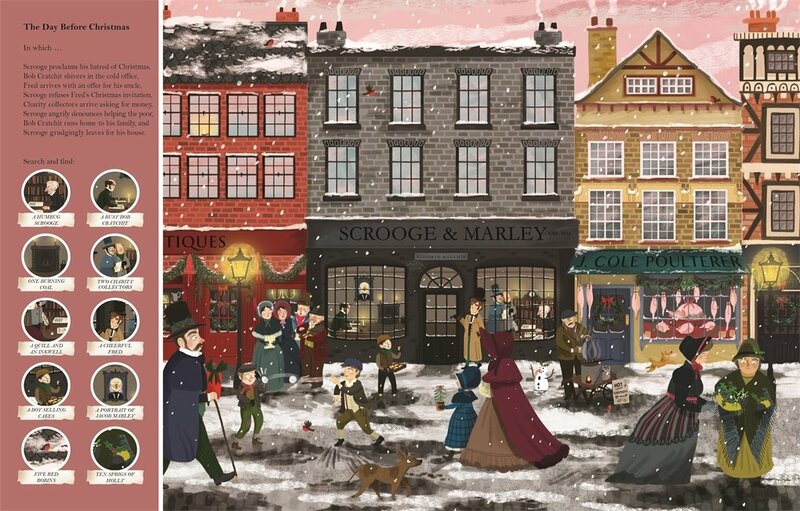 Louise brings Charles Dickens' timeless christmas story to life in a whole new way, with beautifully detailed illustrations and an abridged version of the story perfect for younger children. Kids will really enjoy spotting all the hidden objects in each page spread, as miserly old Scrooge is visited by the ghosts of Christmas Past, Christmas Present and Christmas Yet to Come - before seeing the error of his ways and fully embracing the spirit of christmas. 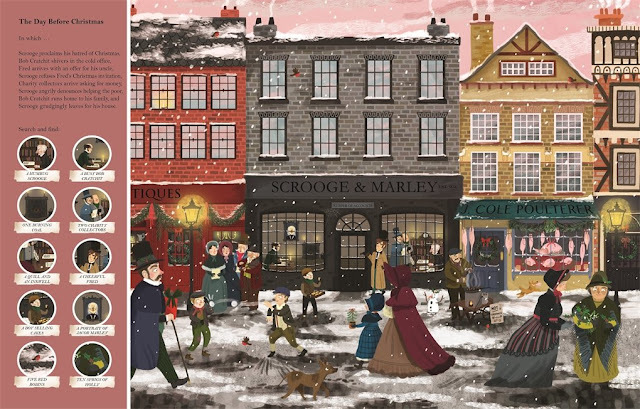 Can you find the portrait of Jacob Marley? Can you also find all the robins? "Yer a Wizard, Scroogy. 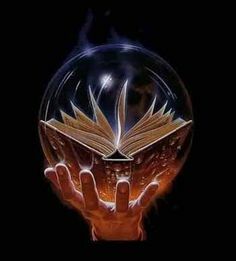 Oops sorry, wrong book!" It's absolutely guaranteed to get you in the Christmas mood this one. For our final Booky Advent Calendar entry on Day 24, Christmas Eve in fact, we've got something truly stunning. Has there ever been a more magical Christmas destination than New York City in the USA? So good they named it twice? In "Red and Lulu" this amazing destination weaves a touch of christmas magic for a tale that starts out in the deep dark pine forests. 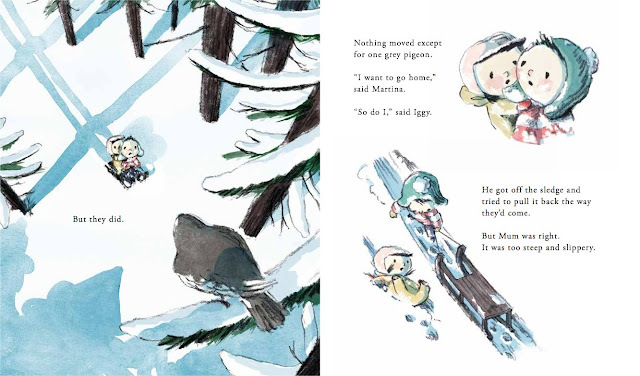 Red and Lulu live an idyllic life in the woods, but when their home is unceremoniously chopped down, and poor Lulu ends up transported away with it, it's up to Red to try and track her down. He searches everywhere, and finds her in the most unexpected place. Could this lovely pair make a new home in the Big Apple? 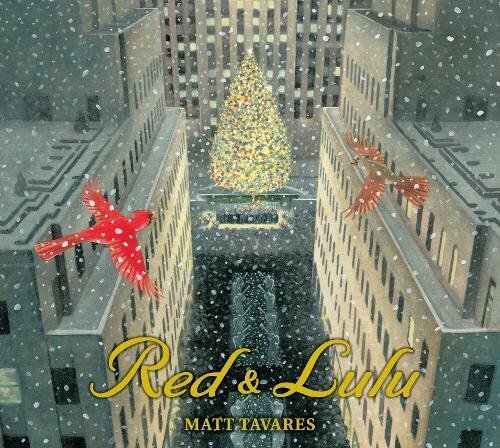 This is a beautifully written and superbly illustrated Christmas story woven with all the ceremony and magic surrounding the Rockefeller Centre Christmas Tree which is what Red and Lulu's pine-tree home becomes. 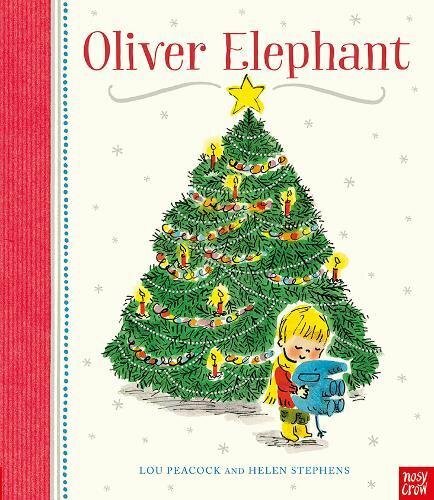 It's so full of amazing christmassy atmosphere this book, yet Matt also tells a cautionary tale of green issues and deforestation, and the displacement of animals and birds when trees are taken in this way. 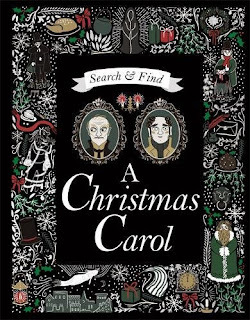 The book works on both levels really beautifully and we're pretty sure it's destined to become something of a christmas classic. 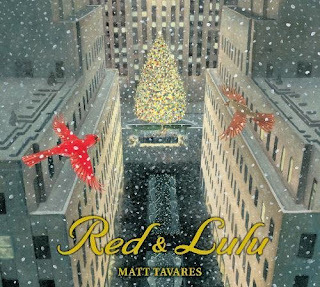 "Red and Lulu" by Matt Tavares is out now, published by Walker Books (Kindly supplied for review). Booky Advent Calendar Day 23 sees the return of a book series we've really enjoyed over the last couple of years. 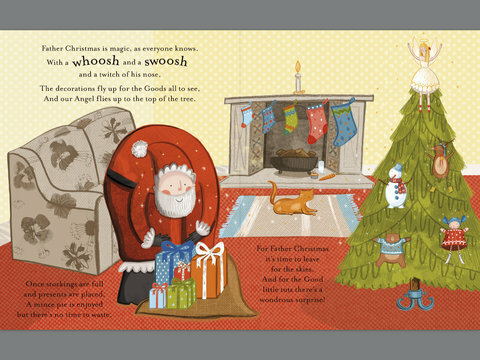 Mighty girl Poppy Pym is back in Laura Wood's latest book in this fantastic set for a festive adventure par excellence! "Poppy Pym and the Beastly Blizzard", clad in its christmassy cover dives straight into an action packed adventure for Poppy. When a mysterious runaway van crashes into St Smithen's on the first day of the new school year, Poppy knows it's going to be an action-packed term! But when accidents continue to happen at St Smithen's, Poppy can't shake the feeling that her every move is being watched. 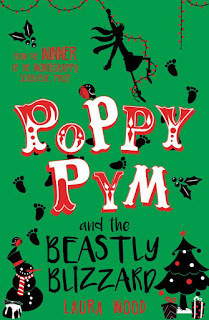 With the Christmas holidays looming, secrets lurking in every corner and rumours of a dangerous beast on the loose, Poppy must unravel her biggest mystery yet. Can Poppy unmask the hidden spy before someone gets hurt? 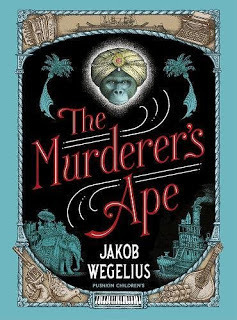 This is the perfect book for your middle grade bookworms to keep them thoroughly absorbed over the Christmas hols with a brilliantly paced adventure full of awesome character and appeal. "Poppy Pym and the Beastly Blizzard" by Laura Wood is out now, published by Scholastic (kindly supplied for review). Our Blog Roundup for 2017 - All our book of the week winners, our Publisher of the Year, Picture Book(s) of the Year and Chapter Book(s) of the Year Winners 2017! It's time for another one of those huge roundup posts to chronicle 2017 so without further ado, let's talk about some stats. In total, we reviewed a whopping 721 books! That's not counting the books we've read, re-read and re-re-read during 2017. This year 65 DIFFERENT publishers and imprints nabbed a prestigious Book of the Week award from us, with us mixing in chapter books, YA and Graphic Novels in with our usual Picture Book fare for the first time in those slots. Of the 65, 24 publishers or imprints nailed the Book of the Week slot more than once. That's hugely impressive considering that a lot of the Book of the Week winners were new publishers putting out their books for the first time in 2017. Non-Fiction scored highly as did graphic novels, showing that there have been some truly brilliant books published in 2017 in both categories. In third place, with a whopping 6 "Book of the Week" wins, it's Dorling Kindersley - Once again showing everyone how Non Fiction can still be hugely engaging in book form, even in our post-digital world. In second place, with 8 "Book of the Week" wins, it's Scholastic who have won us over with some amazing chapter books as well as a strong picture book lineup for this year. But our runaway winners this year, and our Publisher of the Year 2017, there can be only one. This year Oxford University Press / Oxford Children's Books are our Publisher of the Year with a colossal 11 Book of the Week wins this year. Congratulations to their fantastic team, who have pulled out all the stops this year to deliver some of the best picture and chapter book titles we've been lucky enough to review. Massive massive thanks and once again congratulations! Now we turn to our Picture Book and Chapter Book of the Year Winners. Definitely one that's destined to win more and more awards in 2018 and a thoroughly brilliant book from start to finish. Congratulations to Jakob and Pushkin Press. Charlotte's Chapter Book of the Year this year was taken from a shortlist of 7 Chapter Books, whittled down from the many that made our Book of the Week slot. It actually took her longer to choose a chapter book than a picture book, and she opted for a book in a series that was totally new to her this year. She chose this book because it's a seriously funny story, with lots of twists and turns on the way (her exact words). It's not difficult to see why Jeff's books have been international best sellers, and this particular book has been a huge hit with her. Congratulations Jeff and Puffin Books! Moving on to Picture Books and Graphic Novels, it's been such a tough choice this year and both of us have really struggled to narrow things down to a shortlist, let alone a single choice. However, with much cogitation and wringing of hands, we've come up with the following choices. 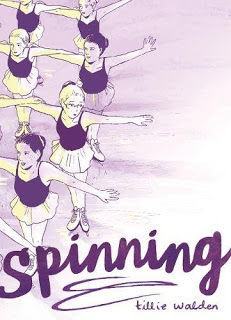 "Spinning" by Tillie Walden (First Second). Congratulations to Tillie and First Second Publishing for one of the most amazing comic stories of the year. Last but by absolutely no means least, it's Charlotte's choice of Picture Book of the Year. She also thought long and hard about this one, whittling her shortlist down to 8 picture books but this was a clear winner. Congratulations Anouk and Drawn & Quarterly. 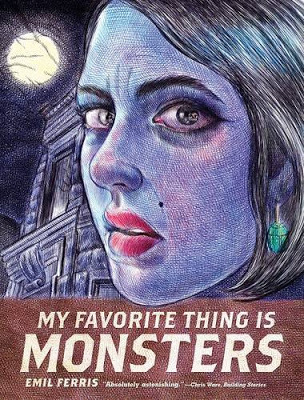 "My Favourite Thing is Monsters" by Emil Ferrris (Fantagraphics). It's a real roller-coaster ride and if you pick up a copy it'll easily last you for the whole of Christmas and beyond. Once again we'd like to thank our readers for sticking with us in 2017, and dropping by to read all about some stunning books this year. We'd like to thank all the publishers who still have us on their reviews list after all this time. Your support and your books mean such a lot to us, and we just can't wait to see what you come up with next year. A huge huge huge colossal cake-shaped thanks to all the hard working PRs who have kept us supplied with those books, have chatted to us over Twitter and Facebook and have joined in with some brilliant debates on all things book-related. You are so important, and you do an amazing job and help us develop and publish our articles with your fantastic ideas and feedback. THANK YOU SO MUCH! To the librarians and teachers who also follow us. You also do an amazing job, never stop doing what you do so well - you are shaping the futures of kids who one day will look back on their time with you and realise how amazing you are. Most importantly, your passion for reading and books is infectious so please keep doing what you're doing, you royally rock! And a big big thank you to the other amazing book bloggers out there. You're a hugely supportive community of like-minded cool folk who have been nothing but fantastic in what's actually been a really tough year for us, and it's been fabulous to see so many people joining in with debates around the ReadItTorials, joining in with discussions on twitter about book-related things and doing such brilliant work on your own blogs. Thank you so much and I hope you've had as much fun with books in 2017 as we have, and we look forward to seeing what you all come up with in 2018. Finally, just so you've got a nice handy dandy reference to all the books of the week from this year, stand by for action! Phew! We're done! We look forward to seeing you again on January 1st, 2018. 9.30 sharp! Be there, or be lying in a comatose heap sleeping off the Christmas and New Year excesses! Day 22 of our Booky Advent Calendar and here's a gorgeously cute little story for your really tiny ones. Who could resist a story about a brave little penguin. 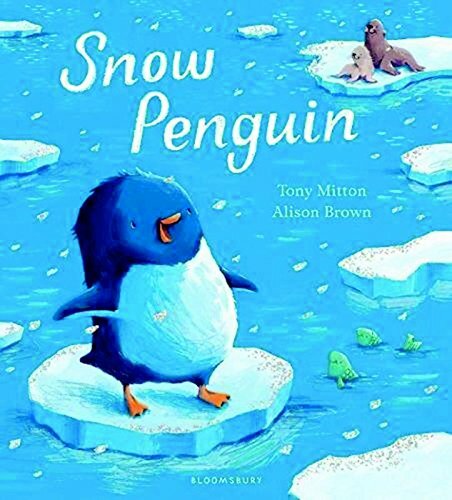 In "Snow Penguin" our curious little penguin hero decides to explore the ice and the snow and the sea. On his travels he sees two blue whales, a family of sea lions and a whole school of orca, but soon Penguin starts to miss his own family. Sometimes coming home is the best adventure of all. Tony's rhyming style is a joy to read aloud. Coupled with Alison's cuddly and fun illustrations, this is a lovely little bedtime read for snuggling up with - and if by now your kids are practically hopping from foot to foot with excitement about the big day coming up, this'll definitely relax and calm them down a tad. 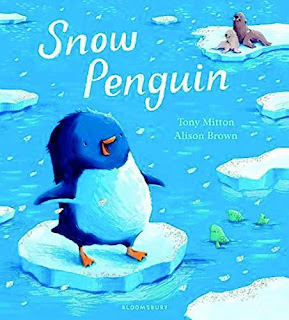 "Snow Penguin" by Tony Mitton and Alison Brown is out now, published by Bloomsbury Children's Books (kindly supplied for review). 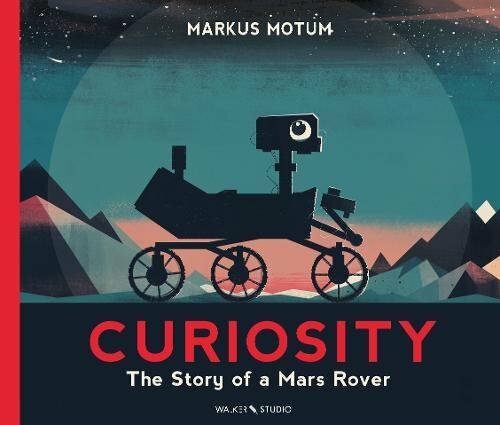 It's our final ReadItTorial of 2017 here on ReadItDaddy (no, really this time) and we're going to throw our hats into the wind, and try once again to second-guess what we think might be the big trends in children's books, chapter books and comics for 2018 - with a few fun nonsense predictions thrown in for good measure. We did pretty badly last year (As if POTUS could even write a book, let alone one that would sell three copies!) so if you'd like to tickle yourself with what we got right and what we got wrong, take a look here. In the meantime though here's ten all new, all singing all dancing predictions for 2018 just as a bit of fun. 1) Fictional Non-fiction will become a thing. No really, we've seen huge leaps in non-fiction titles over the last few years, but very little progress with fictional non-fiction. Hear me out on this one, I think there's a vast untapped market for fiction that is dressed up like your favourite non-fiction titles. Imagine a "Facts about animals" book that went into every gory detail of completely made up animals. Or showed you the inner workings of completely fictional inventions in the sort of detail that would make Dorling Kindersley break into a cold midnight sweat. 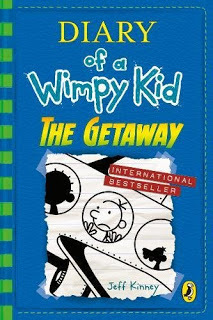 Fictional Non-Fiction: The next great genre for children's books, you mark my words! 2) Someone accidentally invents a fourth 'story type' for children's books that completely breaks the internet. We've heard so many times that there are just three story types for children's books. 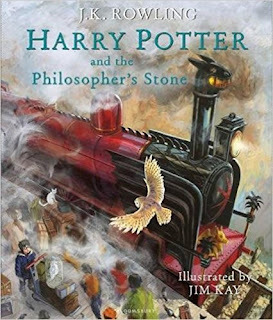 The journey taken, the epiphanic happenstance and the 'kitten that needs rescuing' but a fourth hitherto unknown story type, 'the gaseous eventuality of circumstance' is identified and most children's writers try to unpick the potential of this incredible source of inspiration. 3) The John Lewis Christmas Ad is a white background with 'buy stuff' on it - and is accused of plagiarism by B.J. Novak - the author of "The Book With No Pictures". You just cannot win, can you! 4) Scratch and Sniff books make a colossal comeback. They're the new fidget spinners, slime or loom bands (what's a loom band? Anyone? Completely forgotten!) Unfortunately the newly reprinted copies of "Fungus the Bogeyman: Scratch and Sniff Edition" are seized by customs for containing potentially life threatening hazardous material. Rare copies sell for zillions of Bitcoins on Ebay. 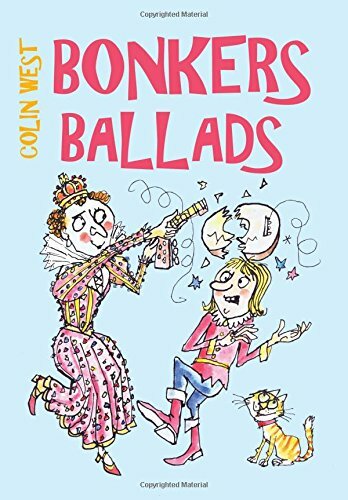 5) Someone describes a new and upcoming comedy author as "The Next David Walliams" and is instantly sued by the estate of Roald Dahl. Come on now, credit where credit's due. 6) The government publishing industry sets up a £30 billion 'think tank' to investigate the possibility of a 'Netflix-like' subscription service for books. The idea is to let people try books before buying them through something called a 'lending service', therefore encouraging children and new readers to get into reading at an earlier age, and stick with books through their academic lives. PHEW! We'll have to revisit these in 2019 and see how many came true. I'm rooting for at least three of these. All the very best from us, and thank you so much for reading all our ReadItTorials in 2017. We look forward to tickling your inspiration again next year. Clad in a new festive and glorious clothbound cover, this timely reissue of Quentin Blake's take on "A Christmas Carol" by Charles Dickens is a looker from the word go. 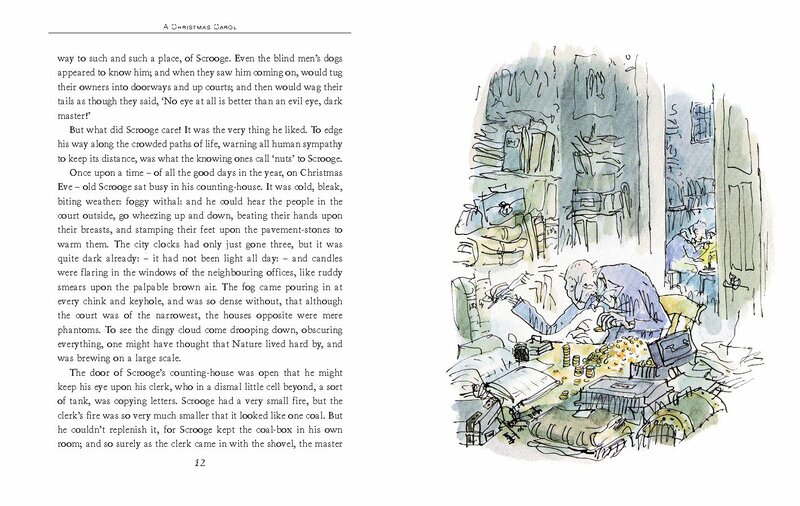 Everyone is probably familiar with the classic tale of Ebenezer Scrooge and his miserly ways, but Quentin brings the story to life in his trademark ink and colour drawings, dazzling and delighting us in equal measure as each of the familiar scenes unfold. Scrooge is a horrid wretch at first, wizened and penny-pinching, he won't even let his employee Bob Cratchitt have a day off for Christmas. But when Scrooge tucks himself up in bed that night, he's visited by three ghosts - the ghosts of Christmas Past, Christmas Present and Christmas yet to come - who show Scrooge what will happen if he continues to live his life in his miserly manner. It's an utterly gorgeous book though...! The beautiful illustrations underpin a child-friendly version of the original story. 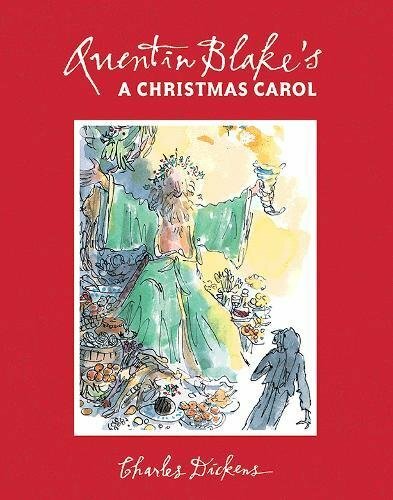 "A Christmas Carol" by Charles Dickens and Sir Quentin Blake is out now, published by Pavilion Children's Books (kindly supplied for review). 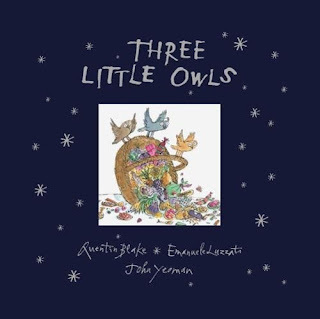 Three cheeky and endearing little owls make Christmas truly special in our Booky Advent Calendar book for Day 20. 5 more sleeps to go but let's find out just how busy these three little owls are. These amazing mums lay an egg each before jetting off on an incredible journey all around the world, carrying with them a wicker basket to gather up treasures and amazing things to eat to help the poor folk of the village celebrate christmas in style. Translated by John Yeoman from the late Emanuele Luzzati's fantastic original story, the book is given even more of a magical touch by Quentin Blake, who lends his trademark illustrative style to this wonderfully flowing story to really help it come alive. It's that rare thing - a Christmassy book that isn't actually that Christmassy, it doesn't ram the festive season down your throat, but delivers a lovely message of hope with three truly fab little characters full of fun and energy. "Three Little Owls" by Emanuele Luzzati, John Yeoman and Quentin Blake is out now, published by Tate Publishing (Kindly supplied for review). Here's a fantastic little activity book for the very young, with 20 play pieces that are easy to slot together and make. 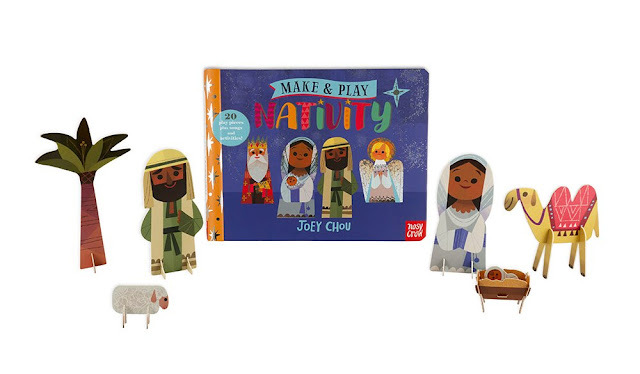 "Make and Play: Nativity" by Joey Chou is a chunky board book that allows little ones to make their own nativity scene complete with Mary, Joseph, wise men, angels, shepherds and of course a tiny baby Jesus himself. 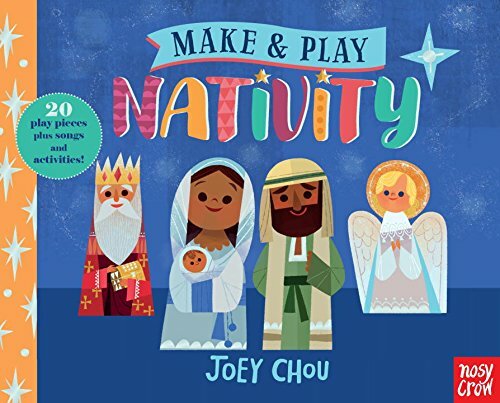 This is one of the most attractive make and play books we've seen, the art style is really fabulously cute and the models are very easy to build. You even get a tiny little crib! So cute! There are 20 play pieces to build for loads of fun. "Make and Play Nativity" by Joey Chou is out now, published by Nosy Crow (kindly supplied for review). We're covering a mixture of early / middle grade readers and picture books in our Booky Advent Calendar for the first time this year, and we're delighted to see another entry in the fantastic Jasmine Green series of animal stories from Helen Peters and Ellie Snowdon. 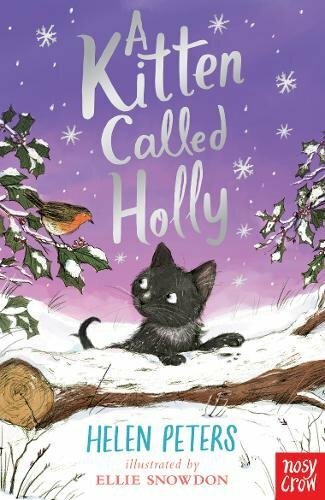 In "A Kitten Called Holly" Jasmine and Tom rescue an abandoned kitten. Jasmine is desperate to keep her. But her parents decide to sell Holly - and Jasmine is NOT happy with her new owner! Can Jasmine and Tom give Holly the best ever Christmas present - a good home? Brilliant touching heartfelt storytelling that will make you laugh and cry, but with the sort of endearing ending that is destined to see this become a well-loved children's classic. Don't forget to look out for Jasmine's other adventures! A Piglet Called Truffle A Duckling Called Button and A Sheepdog Called Sky. "A Kitten Called Holly" by Helen Peters and Ellie Snowdon is out now, published by Nosy Crow (kindly supplied for review). Nosy Crow are really spoiling us this year with one of the strongest publisher line-ups for Christmas books. We're getting close to the big day now, with only 7 more sleeps to go and so we're celebrating with another brilliant entry on our Booky Advent Calendar. Meet "Oliver Elephant" by Lou Peacock and Helen Stephens, the beautiful little tale of a tiny little chap called Noah and his beloved soft cuddly toy Oliver. Oliver plays with Noah, and the two friends have fun in a huge department store while Noah, along with Mum and baby sister go Christmas Shopping. When Oliver goes missing though, things take a sad turn. Will Noah ever find his best friend in the huge store? Perhaps a touch of christmas magic is required! This is a delightful story, beautiful to tell at bedtimes as children are hopping around with excitement and need something peaceful and calming. "Oliver Elephant" by Lou Peacock and Helen Stephens is out now, published by Nosy Crow (kindly supplied for review). The fabulous bakin' boys are back, and this time they're ready for a festive adventure in the latest awesome middle grade book from Tracey Corderoy and Steven Lenton. 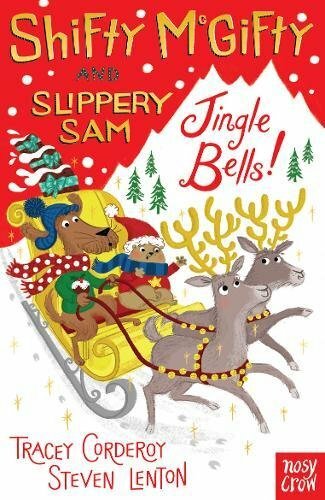 In "Shifty McGifty and Slippery Sam: Jingle Bells" the awesome pooches are all set for a festive mystery, and must pitch in to help Santa solve a terrible crime. Someone has stolen all the christmas presents! It might take a sensitive doggy nose or two, and perhaps even a smattering of snow for these two intrepid hounds to piece together all the clues and reveal the nefarious thief! And that's just the start of their adventures as there's also a sea monster and a rather bizarre moggy to deal with too! 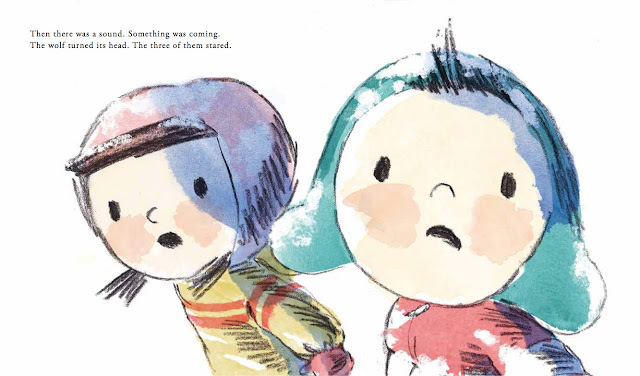 Three hilarious read-aloud stories give kids a head start as they make the shift from picture books to early readers, with characters that are already familiar from their many picture book adventures. Following on from "Spooky School" and "Up, Up and Away" this is a fab festive adventure from Tracey and Steven, who have once again absolutely nailed it with a brilliant page-turning early reader book. "Shifty McGifty and Slippery Sam: Jingle Bells" by Tracey Corderoy and Steven Lenton is out now, published by Nosy Crow (kindly supplied for review). Our Picture Book of the Week this week may have arrived a little late but we're so glad it's here. 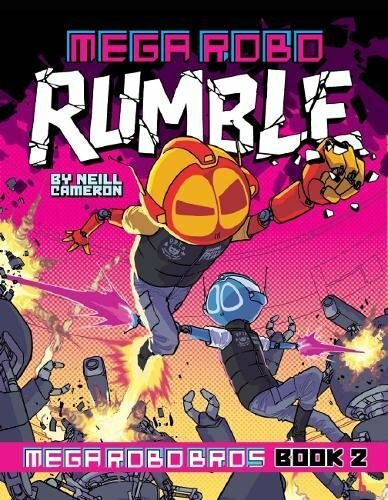 Let's get ready to Mega-Robo-RUMBLE!! It's Day 15 of our Booky Advent Calendar and you know what that means? Even more christmas book loveliness - this time with the latest in the fantastic "Princess" range by Caryl Hart and Sarah Warburton. 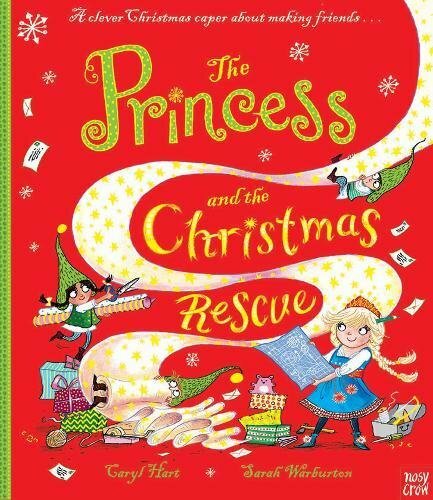 This time we meet a mighty girl princess with a difference in "The Princess and the Christmas Rescue. Princess Eliza isn't your ordinary everyday princess. Though she likes dresses and shoes, she much prefers a toolbox and a stack of materials to make her own incredible inventions and creations with. Her parents despair! Why can't Eliza be a bit more...well...princessy? They urge her to make some new friends, but her various attempts go slightly awry (gingerbread boys are notoriously slippery little customers after all!). Heading out into the forest despite her parents' warnings, she finds a dear little cottage full of elves. These elves aren't just ordinary elves though, and they are fantastically busy making lists and wrapping presents for their unseen master. But who is this mysterious figure? He's suffering from the flu so Eliza decides it's up to her to help these poor flustered elves to bring Christmas to all. 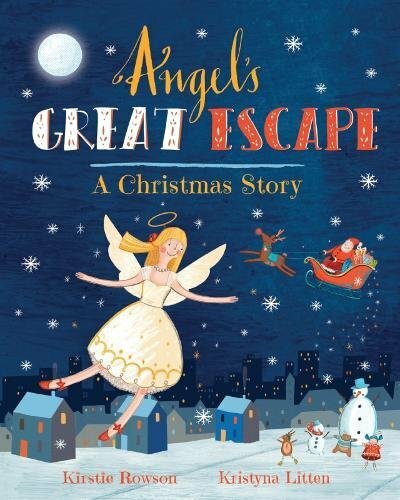 So good are her efforts that Saint Nick finally arrives to whisk Eliza away on a fantastic Christmas Eve journey, and perhaps even deliver a special present to Eliza herself. This is utterly magical christmas bookage in every way, from two of the most talented folk in kidlit. "The Princess and the Christmas Rescue" by Caryl Hart and Sarah Warburton is out now, published by Nosy Crow (kindly supplied for review). 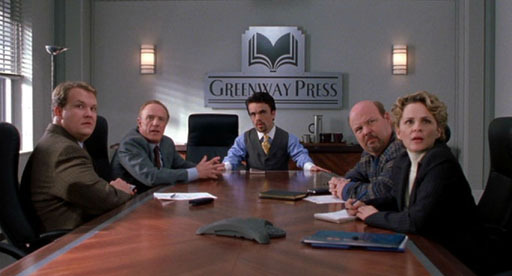 "Come on, ReadItDaddy, let's hear your pitch!!!" This Christmas Holiday it's going to be make or break time for my writing once and for all. Lately I've been wondering whether the whole 'getting something published' thing is ever going to happen. Time and time again I see lovely folk getting publishing deals, folk working through their SCBWI memberships and actually seeing their subscription fees proving to be worth their weight, but with any open submission calls, my wave of enthusiastic emails with manuscripts and the (sadly) eventual 'Sorry dude, you just don't got it!' emails, I'm rapidly losing heart. That's really not a dig at anyone who has recently been signed, trust me on that. I love seeing other people get deals. No, really I do - because I'm the sort of person who knows that those people have something to contribute, will undoubtedly have that initial level of enthusiasm and gusto that the industry needs so much, and that those who have plugged away for years with their own work are more than ready for the resultant harder work to come. But watching from the sidelines when someone gets a deal, gets ushered into that hallowed clique of 'published children's author' and suddenly transforms into something of a divine being, respected by other authors, educators, agents, illustrators, librarians and of course their intended reader audience (yep, basically all the people that matter when it comes to publishing children's books) it's hard not to feel a pang of jealousy. We're only human, after all. As I've said in previous ReadItTorials on the subject, I don't have material reasons to want to get published - I mean what on earth would be the point in chucking away a fairly respectable career in IT to earn less than £10K per annum (which is, reportedly, what most authors struggle to make per year). No, my reasons are varied and complex, but have a lot to do with something I'll come to by the end of this post. I've read and digested so many 'helpful' nuggets of advice on how to get published, how to win agents over, how to get to the top of the slush pile when publishers have open submissions - to the point where I'm beginning to wonder what exactly it is that folk are looking for any more? It feels like the creative explosive and yes, the chaotic elements that go towards making a children's book that truly stands out are being lost completely in a slightly comfy fuzz of 'sameyness'. That's the bit I get really grumpy about. When I see yet another bloody dreadful 'cookie cutter' book getting published with a huge PR buzz, I shake my head and wonder how that came to happen. I won't mention specific titles but looking ahead to our schedule for early 2018 I'm once again wondering whether half the problem I've got is that I just cannot stick to the rules of writing effectively for children - I want to write and get something published that isn't just another fluffy bunny story about having a friend, losing a friend, getting that friend back, and realising that friendship is EVERYTHINGGG. Moral tales, more than anything else, are really beginning to stick in my craw a bit, like every story absolutely has to have some sort of lorded 'example' to live up to (note that I'm talking predominantly about picture books here, there seems to be a little less of a rule book when it comes to middle grade but again there are way too many MG books that rely on shallow laughs and extremely samey characters, I like to call this "The Walliams Effect" though that's not a dig at his work, more a dig at the many, many other books that try to follow his example to the letter). I'm very realistic about harming my own chances of being published by not attracting an agent, and again the odds seem stacked against me there too. I also know that working full time for a living leaves absolutely no time to engage with what you'd need to do in order to be your own PR when your book finally gets a green light. Nor do I have the luxury of time to sit there tweaking manuscripts, soaking up the really useful advice and feedback I've had from a select few folk who do 'get' the rules and requirements for kids books. So is there any point in carrying on trying? Then I slap myself around the face a bit. 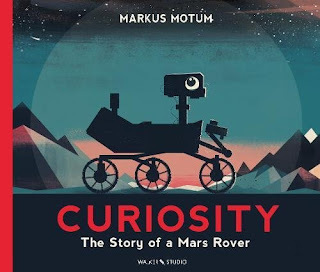 From this year's crop of children's books, the ones that have inevitably ended up as Book of the Week winners are definitely the sort of books I'd want to emulate - or to list as influences. More often than not their core ideas are blisteringly original, they don't try to cram a life lesson down your throat. My inner voice tells me that these books were read, edited and accepted. These books were published, have been marketed, are selling and reviewing well. SO WHAT AM I DOING WRONG?!?!?!?!?!?! Over the last weekend I'd really made up my mind to completely jack it in. Ditch the writing, continue on with the blog as long as C was interested in it, maybe scribble a few drawings here and there and blat them out on Twitter. But completely can the writing and the ambition to be published. If the ideas I've put out there are no good, and not attracting agent or publisher attention, they're obviously just no bloody good and that's that. There was only one thing that stopped me from dragging all of my current manuscripts into the trash and hitting 'delete' for good and that was a purely unprompted statement from C.
"Are you still writing stories, Daddy? Because I think you should." As hatefully cheesy as it sounds (and this had nothing to do with me ranting about the subject at all at home - I never do, purely because I have no audience whatsoever for my rants along those lines at home and I'm pretty sure I don't have one here either, but if you've stuck with me so far, I LOVE YOU). If there's ever a reason to carry on writing, to keep trying, to never give up, it's because someone who loves, respects and looks up to you wants YOU to set them the one example that cheesy children's stories or other authors can't capture the essence of. They want to see their own parents digging the hell in and refusing to lie down and take a defeat. Get up, get back up, and get the damned job done! So I need to be a better person than the one who momentarily took over at the weekend and got completely downhearted with the whole attempt to bring my stories to others. I need to be strong enough to take every setback, putdown, irritating niggle about the business and drag THAT into the trash bin instead. I need to keep on keeping on, because until I'm finally unable to hold a pencil, type on a keyboard, or dream and daydream stories, I should never say I'm done. Never say I'm finished. Well, at least until next weekend. Strange bouffant hair. Sharp suit. "I want it all" attitude and prone to childish tantrums? No this isn't a biography of POTUS, it's actually a very funny christmas book for our Booky Advent Calendar Day 14. It's the run up to Christmas and if there's one thing Morris is sure of, it's that he wants his presents this year to be even more amazing than last year's! So on the 12 days of Christmas, Morris' long suffering parents begin to pull out all the stops, ensuring their spoilt little diddums gets exactly what he wants. The first present is small. That simply won't do. The next present is larger, but Morris is sure his parents could do better. MUCH better. So the chaos builds, as his poor mum and dad try every day to impress this fussy little 'prince' (yes, that's why he has a "P" on his badge, it's got nothing to do with being the president or anything. Oh nosirree). By the end of the book you're wishing something rather unpleasant on this fellah - and you'll get your wish (though we were both a little disheartened to see that there's an almost happy ending). Charlotte's favourite bit: Morris almost gets his comeuppance. Almost! Daddy's favourite bit: Joshua knows how to write a storming slow-build of a book that rapidly descends into complete chaos as Morris' demands are met. An awesome idea, and yes we loved Amelie's rather cheeky 'homage' for sure! 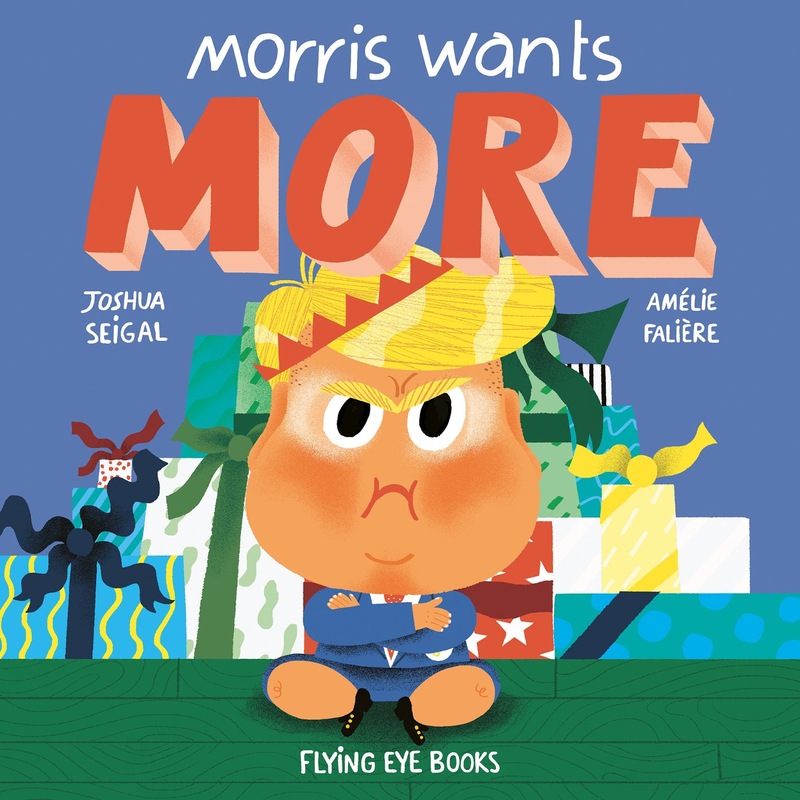 "Morris Wants More" by Joshua Seigal and Amelie Faliere is out now, published by Flying Eye Books. 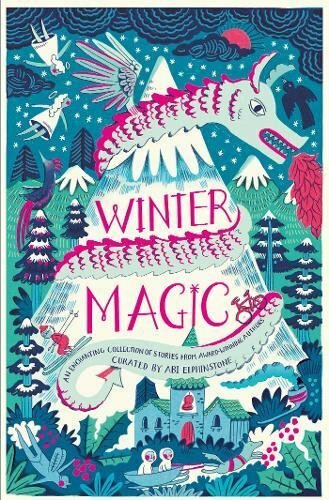 Another glorious wintry book chock full of magic adds to our festive Chapter Book celebration and a worthy entry on our Booky Advent Calendar for Day 13. Here's "Winter Magic", another utterly amazing anthology of stories curated by Abi Elphinstone. Abi's own story "The Snow Dragon" tails off a superb collection of stories from some of the greats in children's literature. Folk such as Michelle Magorian, Geraldine McCaughrean, Jamila Gavin, Berlie Doherty, Katherine Woodfine, Piers Torday, Lauren St John, Amy Alward, Michelle Harrison and Emma Carroll contribute a wondrous mix of stories, with dragons and elves, mountains and magic and of course a wonderful dusting of festive snow. "Winter Magic" by Abi Elphinstone, Michelle Magorian, Geraldine McCaughrean, Jamila Gavin, Berlie Doherty, Katherine Woodfine, Piers Torday, Lauren St John, Amy Alward, Michelle Harrison and Emma Carroll is out now, published by Simon and Schuster (kindly supplied for review). In a break from our usual programming we're joining in a fantastic blog-tag-o-thon, and thank you V much to Bex over at https://bexcapadestravellingwithanxiety.wordpress.com for hitting us up. So without further ado...bits from both of us! Daddy: Oh gawd, this is a harder question than you'd think. I love classic Tex Avery cartoons (particularly stuff like Droopy or Screwy Squirrel) - Not very politically correct but they were so inventive and funny, and you never get bored watching them over and over again. I also love anime (Dirty Pair, Appleseed, Wings of Honneamise) and of course everything Ghibli and Pixar too. C: Either singing Despacito at the top of her voice, or Barbie Girl by Aqua. What is something that your followers would be surprised at? C: I am double jointed and can bend my elbows right back into weird angles. Daddy: I can skate like a diva, but only on inline skates. I am rubbish on quads or ice skates. I used to play Roller Hockey (again on inline skates) and that's about the best way to learn how to be fast and manoeuvre your way out of trouble in a hurry. C: Maths. Maths is unnecessary, right? C: Playing the piano. OK it's not that unusual but I can't think of anything else. Daddy: Aside from the skating, I make amazing pizza dough from scratch. 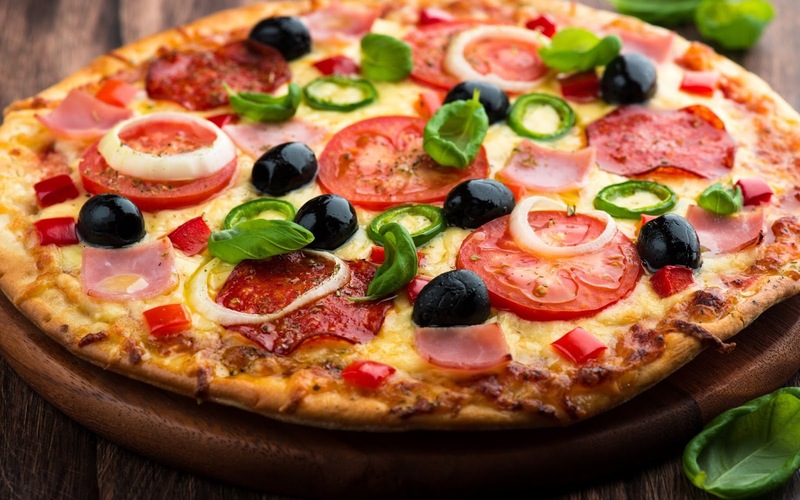 I keep kidding myself that if my current job went sideways I could always set up a poncy artisanal pizza stall instead (and probably make four times as much dough..er I mean cash!) I can also speed read which comes in VERY handy when you run a book blog. C: Christmas decorations, comics, a lot of amazing fashion designs and artsy stuff. I love making stuff. Daddy: Not sure if drawing counts, but I've drawn at least 2-3 pieces of art a day. It's all I'd do all day every day if I could. Oh and I made pizza dough this morning before work which is no mean feat. C: Making comics after Neill Cameron's excellent comics workshop at the Story Museum. There aren't enough girls drawing comics so my friend and I are going to do more! Daddy: Writing children's stories, sucking at it, but basically having a word with myself to step back from it, breathe, re-assess 'the rules' and get back into it and really try and get something published. C: Cats. Everything to do with cats. 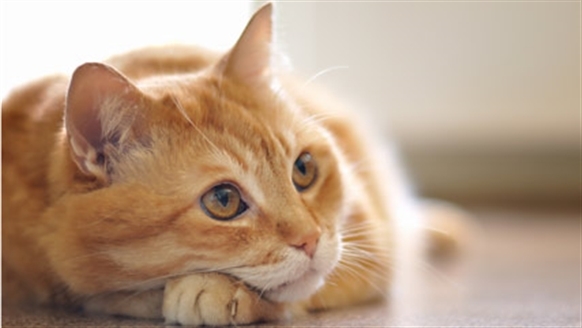 I would have a house full of cats but we can't have them where we live. Boo hiss! Daddy: Passionate people. I love people who really just do not care what anyone else thinks, they know what they love and they will pursue that love regardless of the rest of the world. Passionate people who are almost tipping the point of being dangerous about their obsessions are the best to be around. Whoah, well that was fun! Our Booky Advent Calendar second book for Day 12 is truly something special. 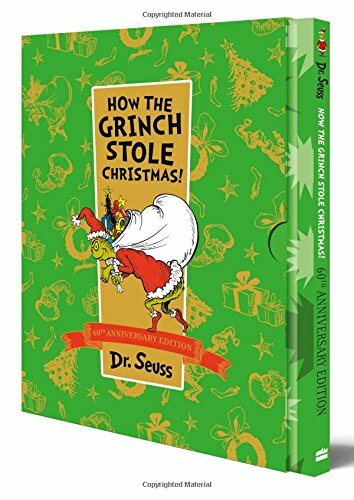 Very few books can claim to have filtered their way into popular culture to the extent of Dr Seuss' amazing "How the Grinch Stole Christmas". Even on this side of the pond, you sometimes hear people being referred to as "A Grinchy-Poo" rather than Scrooge, and it's amazing to think that this stunning book is 60 years old. To celebrate, HarperCollins have prepared a really amazing version of the book, clad in a gorgeous foiled cover and slip case, giving the whole thing a real air of luxury. The tale itself, of a heartless creature who truly hates Christmas - and wreaks a terrible revenge on the innocent "Who" folk one year when he's had just about enough of their festive shenanigans - actually ends up being one of Seuss' most impressive stories (and that's saying something for one of the most prolific and consistently excellent children's authors ever). In case you haven't encountered this story before we won't ruin the ending, suffice to say that the influence of this book on so many generations of stories to follow is easy to observe, so treat yourself to a truly sumptuous version to keep for your kids and grandkids, you really won't regret it! "How the Grinch Stole Christmas" by Dr Seuss is out now, published by HarperCollins Children's Books (very kindly supplied for review). On the 12th day of our Booky Advent Calendar, our postie gave to us...a great big bear hug of a book! 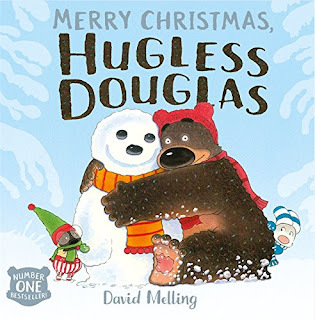 "Merry Christmas Hugless Douglas" by David Melling is a special festive story for everyone's favourite big fuzzy furry bear. Hugless Douglas knows what Christmas is all about - snowing sheep, finding a tree, sledging and and making new friends like Rudi the Reindeer! Oh and let's not forget a ton of christmas hugs! Douglas certainly won't be hugless this year! This endearing series goes from success to success, and now Charlotte is old enough to tell stories to her little cousins, they always ask for these books. 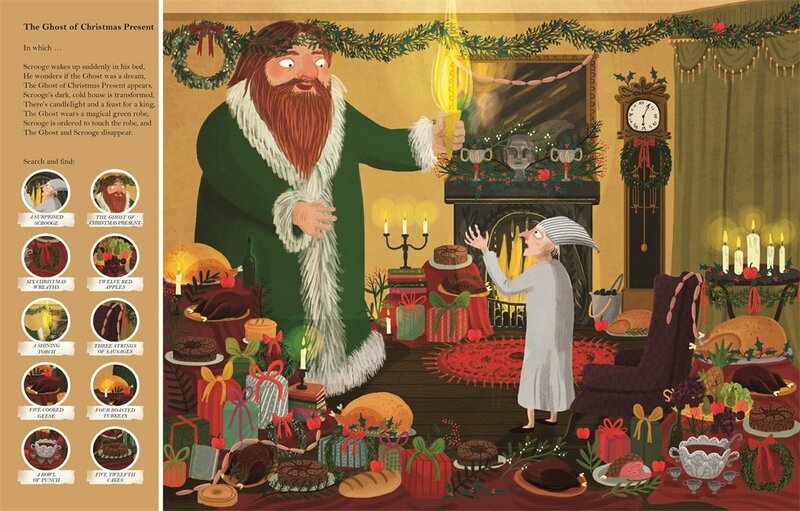 Full of David's delightful storytelling and absolutely cracking illustrations, it's another festive winner! "Merry Christmas, Hugless Douglas" by David Melling is out now, published by Hodder Children's Books (kindly supplied for review). We're returning to a fantastic story that, way back in the archives, we first took a look at in E-Book form all the way back in 2012. 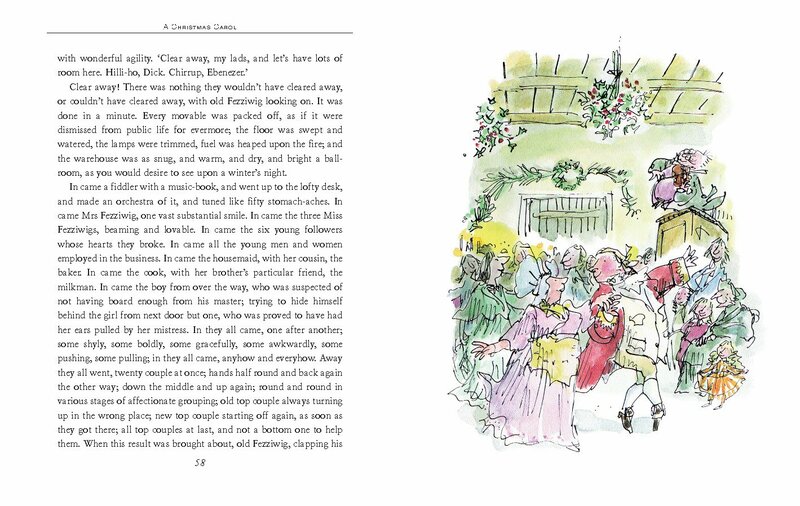 Back then, our review (and a previous Booky Advent Calendar entry for the iBook / Kindle version) spoke very highly of this charming and beautifully written story, brought to life with wonderful festive illustrations. Secretly though, we always wanted this one to become a print book - and now it has, in fact we somehow missed out on reviewing this print book version for our last set of christmas roundup reviews - so we're happy to rectify that (thanks to Kirstie) with a closer look at the glorious print version. As the snow crunches underfoot, Angel and her friends bravely venture out on a journey to find a new home. Unfortunately, a nasty scratchy moggy is in hot pursuit! Christmas is saved! Thanks to the big guy in the red suit! Thus begins a race against time, and a wonderful christmas story with all the right ingredients to keep your little ones enthralled. Even now, as a fussy middle-grader Charlotte remembered the story from when we'd read it in electronic formats, and we snuggled down together for another enjoyable read through. The print version is sublime, and definitely belongs on our Advent Calendar this year. You can get the book from most retailers (and Amazon of course). 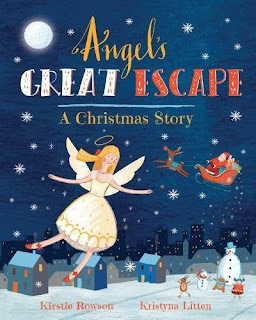 "Angel's Great Escape" by Kirstie Rowson and Kristyna Litten is out now, published by "And So We Begin" (kindly supplied for review). As soon as the calendar turns over for December, we're longing for Snow (though it's not much fun to try and commute through, it is lovely to imagine that the dusty cobweb-covered old sledge in the loft might get some action this year). Imagine being tiny again, and looking out your window at the flurries and drifts of snow, and all the endless possibilities for fun that can be had. That's what Sean Taylor and Claire Alexander perfectly capture in our Booky Advent Calendar book for Day 10, "The Snowbear". 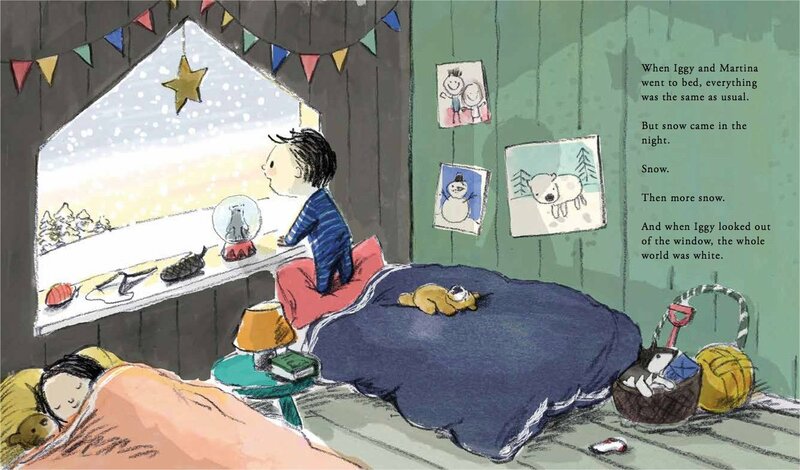 Snow comes in the middle of the night, and Iggy and Martina can't wait to get out in it and make a snowbear. They then go on an exhilarating sled ride that takes them deep into the woods, but how will they get back home again? Beautiful snowy landscapes and the sort of story that pinches your cheeks with that frisson of winteryness. Love it! It's going to take a touch of snowy magic for the pair to find a way back to their cosy little house. Oh my! A moment of danger and excitement. 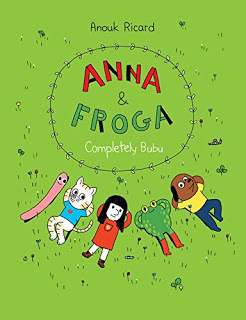 The story builds up to quite an exciting climax as Martina and Iggy end up in a dangerous situation a long way from safety, only to discover an unexpected ally in a real wow moment in the story that's sure to delight little ones. 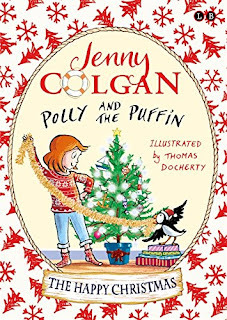 We always wonder if we're ever going to see the next Christmassy classic in the making on the blog when the new year's crop of christmassy / snowy stories arrive. It looks like we have a winner here, this is as close to christmassy wintry perfection as you can get! 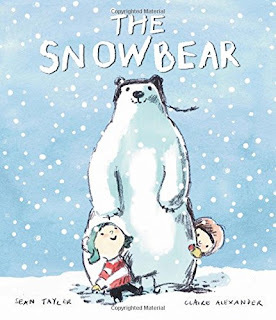 "The Snowbear" by Sean Taylor and Claire Alexander is out now, published by Words and Pictures (kindly supplied for review).